This is my life. My REAL life. People ask me sometimes, "No way that is real right? You do know how to tell a story though!" Let me tell you, as I fall onto my bed at the end of the night, I look up at the sky amazed and wonder, "No way is this real, right?" Yes. It is. Even those closest to me sometimes voice their disbelief, "How is that POSSIBLE?!" Most of the time, I really don't believe it either. Sometimes I pinch myself to make sure I am awake. I am. Yes, it is happening. 11 children. Then 7 abandonned. Then one taken, then brought back. Then 4 burn victims. 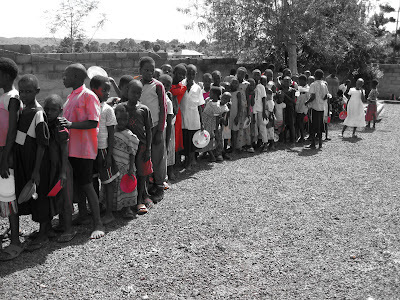 In the last 3 weeks we have added almost 75 children to our program. When I go to serve lunch, I have to take a new head count EVERY day, just to make sure I have the number right. Its happening. As I lay in bed in disbelief at the end of another beautifully exhausting day, I marveled with God as the "impossible" things that happen in my life. And I realized, when have you ever read a story of God's great movement that made a lot of sense? That didn't seem a little over the top, a little impossible? Not often. Radical, extraordinary love just doesn't make sense in a fallen world. That doesn't mean it can't happen. But it is the very nature of God. Moses parted the Red Sea, and I bet people thought, "No way this is happening!" Noah spent 120 years building an ark and I bet people thought he was just crazy. When Joshua went to Jericho, God told him to march around the city once for six days and seven times on the seventh day with seven priests blowing tumpets made of rams horns. I bet Joshua didn't think that made much sense. I bet Abraham didn't think it made a whole lot of sense when God ask him to kill the son of whom He had promised would come nations. Jesus told His disciples to pass out five loaves of bread and 2 fish to over 5,000 people and I bet they looked at Him like He was crazy! Later, Jesus told Peter to walk to Him on the water through a storm and I know that Peter was afraid. We read these stories and think that they are awesome examples of God's amazing power and love and yet sometimes we don't really believe that they could still be possible. We think that maybe Moses, Abraham, Joshua, Noah or the disciples had something we don't. But I don't think that is true, God is the SAME yesterday, today, always and we were ALL created in His own image. This means that all these impossible things could just as easily happen for US too! Radical, different, extraordinary... It still exists! So for those of you who read this and say, "No way," that's ok. Because I live it, and still every time a new child shows up at my door with an even greater need than the last I think "no way." But here is the thing - I want big things from God. We want big things from God and then think its strange when He asks us to build an ark, or feed 5,000 or march around a building for seven days with seven priest blowing trupets made of the horns of a ram. I am asking for big things from God. Big things like a van I can take my whole family to church in and a house with ten showers for Friday. BIGGER things like 147 million orphaned children in the world to EACH have a mommy who knows what he likes for dinner. So really, I am not so surprised at the crazyness. Every morning as I wake up with some impossible ask in front of me, I know that God will meet it with impossible strength and love. I serve the God who used Moses, a murderer, to part the Red Sea, a God who let Peter, who would deny Him, walk on water. A God who looks at me, in all my fallen, broken weakness, and says YOU can do the impossible. This post is dedicated to my dear friends Phil and Amy who know what it is to do the impossible, loving their sweet baby boy extraordinarily, sharing his life with many, and recently watching him be taken to Heaven. They allowed God to use Dylan's life to minister to so many. They are a constant example to me and all who know them of how love extravagantly, like Christ. To Gwen and Suzanne, whose lives are almost as impossible as mine. To Gwen who loves, prays over, and mothers babies that will not be hers until they find a forever family, and shows extraordinary, impossible strength in doing so. And to Suzanne who is a CONSTANT peaceful ecourager, offering quiet and kind words. To Mike and Uncle Denny who have both been resilient in battling cancer and have been impossibly good natured and continually supportive, offering me so much love, even in their hurting. To the Minovich family, who I am so excited for, as they bring home not one or two, but FOUR new children and continue to offer their home to this dream of helping the orphans. To Candace and Dave Able who proabably never have time to read this as they parent more children than I can count. You are the hand of Christ. Sometimes I feel like my life is difficult, and then I remember the wonderful weekend I spent in your home and think that my life doesn't come close to the difficulty that you meet with such strength and love each day. To my mom and dad who are extraordinarily supportive of all my crazyness, who have loved me SO UNCONDITIONALLY and who have taught me how to love every person I meet with big, real love. None of this is possible without you. Keep doing impossible things. As God asks you for more, He continues to meet each need with impossible strength, energy, and love. How true that we expect big things and are surprised when they happen. Katie i get sooo excited when i open up my computer and click your bookmarked page and see your new posts. I LOVE hearing about your life. Remember hanging out at our house and laying on the kitchen floor with no power and trying to relax and dreaming about life in north american after a rough day? Funny how moments later we'd start talking about Paulson or Allan or creepy peter and laugh and love and LOVE our lives in Uganda. I always thank my God as I remember you in my prayers, because i hear about your love for all his people and your faith in the Lord Jesus. I pray that your partnership with us in the faith may be effective in deepening your understanding of every good thing we share for the sake of Christ. YOUR LOVE has given me great JOY and ENCOURAGEMENT, because you, my SISTER, have refreshed the hearts of the Lord's people. Today at church the visiting visitor said Why do we tell God about how big our "mountain" is? When we should be telling the mountain how big our God is. I thought of you- I don't know you but in this blog I see your heart..... I believe you don't even see the mountain you only see God and follow Him. Just like all your Biblical examples. THANK YOU FOR SHARING! PRAYING FOR YOU AND YOUR SUPPORT SYSTEM! I pray for you every day. My heart is changing because of your healing words, your testimony of a loving God, of a Saviour who knows and loves us all. Thank you for your posts! I LOVE reading your blog!!!!!! Keep seeking. Keep praying. Keep stepping out in FAITH. My definition of FAITH: Fantastic Adventure In Trusting Him. That, dear Katie, is the life you are living. 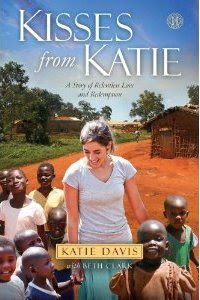 Katie... such beautiful life lessons from one who is so young, but so grown up in the Lord. I pray that you will continue to walk in God's impossible ways. He is so pleased to be making the impossible possible through your hands. I love the pics- the b&w with the red looks awesome! Such a wonderful reminder that He can do ALL things. We cling to this truth and SEE it daily as Abe is doing the impossible. Thank you. You have just given me the encouragement I need to do something big that I haven't felt I could accomplish. I needed exactly this message. Katie! You will never know, this side of heaven, how many lives you are impacting for His kingdom by living out your faith in Jesus Christ in such a REAL way!! I just came across your blog and cannot stop reading it! You are doing many amazing thigs in your life! I check your blog everyday and love when you have posted! It is AMAZING what is happening with all of these kids! I pray for you every day, and know and trust with you that God is going to take care of all of your needs! Or just to add even MORE children to that lunch line. Wow.. you are something. I am constantly in jaw dropping awe of your faith. Oh Sister I am praying our lives never make sense to UNBELIEVERS ... that we are crazy everyday for the Father and hear His voice clear ...That we give more of ourselves, more of our money, more of our time, more of our heart, more of our resources, and more of our souls for whatever ARK, RED SEA, WALKING ON WATER, or LOAVES/FISH God calls us to ... I want to see the FATHER do the IMPOSSIBLE in my life !!! I LUFFA you ... Know that you are changing the world "ONE HEART BEAT AT A TIME" ... remember the SCC song we listened to in my car ... It reminds me of you !!! Katie, You are beautiful in every way. God is enchanted with your beauty. A post you wrote a few days ago reminds me of a quote I have hanging on my fridge... "God is love. Therein lies our confidence that Love will never fail!" Be strong, sister. I'm praying! Ok Kate, its time for Dad to chime in. I read these comments of people referring to you as lady or woman. Don't they know you are my precious little girl? Then I look around my office and see the pictures of you and your beautiful Ugandan girls and realize my little girl is just that...a woman of God. What an amazing servant of God you are. I burst with pride as I read your words. I look at your photographs and see the gleam in your smile. You inspire me each and every day. You keep loving and we'll keep supporting. As much as I miss you, I admire you even more. You make a difference Katie each and every day. That is such an amazing gift. Thank you for sharing it. You keep touching every life you come in contact with. You make this world a better place. Oh boy...your dad's post made me cry more than yours! To think how happy our heavenly Father is when we love His little ones. Amen, katie! Amen! We serve an impossible God who is truly in the bussiness of parting the seas, moving the mountains and having His people walk on water! That is the kind of awesome God we have! May God continue to use you in mighty mighty ways! I am touched so deeply and encouraged every time I read your blog. God has given me a heart for orphans.. as I was an orphan once. Now as a mother of - soon to be four(one foster) and one on the way I know that i can pray. But sometimes I wonder if that is enough.. truly enough. There are so many children who need a Mommy & Daddy to tuck them in at night. So although I feel like I am doing some in giving one a home.. I pray and am encouraged that one day I too will have a home full of children who also need a mother and father to love them deeply and show them Christs love. You are such an encouragement and blessing and I will continue to pray for your ministry. And even in the midst of hard or overwhelming times I know that God has given me enought strength to love.. and to love even more!!! God is good.. thank you for your encouragement & will continue to pray for you and all your children! Each and every blog is a wonderful inspiration to a growing group of followers. One little girl working for Jesus has done so much for His children. Thank you, Thank you. We are so proud of you and the love that fills you and everyone you come in contact with. My prayers are with you and I thank God for using you in his work. Amen! May He continue to do impossible things in your life and the children you care for! I am so glad that we worship a BIG God who can make miracles happen. Thank you for being such an inspiration to me. I am so inspired as I read about you believing God for the impossible. As Larry and I are on our journey to adoption, we continually see God stretching our faith to believe Him for what we cannot see. The faith that you have on your journey, and those you described from the Bible, challenge me to truly want to live by that same faith. He is the author and perfecter of it!! I am so thankful to hear about how God is working through your life in Uganda! In case you don't remember....I'm Phil and Amy's sister in law....the one in Evansville. You are doing some amazing work!! I'm happy I came across your blog. Where in Uganda is amazina? I'm currently raising money to build a primary school in Apac, Uganda. I love on your blog how you have the time in Uganda posted...I read your blog usually about 11 p.m. and it's around 8 a.m. where you are...so I take a minute and pray that God give's you discernment and that He meets your needs for the day and that He gives you the strength to meet His needs! You said " Radical, extraordinary love just doesn't make sense in a fallen world...that doesn't mean it can't happen" You hit the nail on the head! Our pastor preached a sermon about how we have exchanged our radical love for God for this civil love...and all that we miss out on because of it! My mom was an amazing woman of God and she passed away when I was 11 (I am now 24) and I actually found one of her Bible's this past year and in it she write's "Let go of your security blanket and have radical dependence on God" thankyou for showing me what that really looks like! What an amazing post Katie!!! We serve and INCREDIBLE God!!! Who are we to ever doubt His power?!?! I just want to quick thank you for the lessons you have taught me without even knowing it. I feel like God has been asking me lately to live that life of faith here, and when I've learned to do that, He will let me go elsewhere. I am so anxious to go, but quietly He whispers, "just not yet." But i've realized He still wants me to live it while I'm here, until the time comes when He opens the door for me to go elsewhere. Reading posts like these reminds me of the Awesome God we serve and gets me so excited at the realization that He LIVES IN US!!! He has given us His power, we just have to trust Him. Incredible. So, thank you for sharing your heart, it has truly touched mine. You get so many comments on your blog, I'm not sure you even have time to read all of them. I have just been introduced to you in the last week, and this is how far back I've read so far. Feb. 8, 2009. I can't stop reading. Your story and your life challenge me, and I have you and your girls on my mind and in my prayers all throughout the day. We just donated some money, and I emailed Gwen to ask a few questions. I'd like to mail you some things. I'm waiting to hear back from Gwen to see what you might need. God bless you and keep you strong, woman! Love to you and all of your precious sweet babies!!!! A few months ago I started sponsoring an Amazima child and then my husband got me another one for Christmas and I am honored that I get to be a part of the work you are doing. I am so encouraged by reading your posts and excited at what God can do through you and me. My heart breaks when I see the need and I dream of a day when I can do even more! I pray for you often. Keep writing girl:) My family loves you (I read your book to my girls ages 7 & 10) and they always ask if they can go see Katie and all her girls. I love your blog updates! I have read your book twice, and I love getting updates on the work God is doing in Uganda. We signed up to sponsor a child last month, and received our sponsor packet in the mail today! I cried when looking at the artwork, and reading about the sweet little girl who is being blessed through the sponsorship program. Praying for her, you, and everyone there in Uganda.